Acute leukemia: Develops and progresses rapidly. Patient may feel tired,is vulnerable to development of bruises and is also susceptible to infections. Acute leukemia is characterized by the production of Leukemia cells that are immature blood cells, normally referred to as blasts. Immature blood cells or blasts have the tendency to divide rapidly, which is out of control and that is how the Acute leukemia also progressively grows. However, unlike normal blasts cells, they do not stop dividing. The difference between Acute and Chronic leukemia lies in the pace of the onset of the disease and level of maturity of the Leukemic cells. Acute leukemia progresses and manifests itself in weeks whereas Chronic Leukemia may take even years to show up. Secondly, although in both the cases the leukemic cells are immature blast cells. 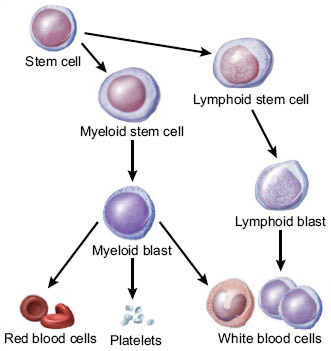 However, in Acute leukemia, the affected cells are completely immature and in their first stage of development from hematopoietic stem cells to mature specialized blood cells whereas in Chronic Leukemia, the affected leukemic cells are further down their path to maturation and development. i.e., they are more like mature specialized blood cells in appearance and function, though not normal. They not only divide rapidly but also live longer than normal cells would do. Chronic Leukemia: Develops and progresses slowly, over years. Unlike Acute Leukemia, patient may not feel sick initially and most of the times Leukemia is accidentally discovered in a routine blood test. The leukemia cells are more mature as compared to that in Acute Leukemia, however, they are not fully normal and work well in this type either. They are not capable of fighting infection as normal White blood cells would. As compared to Acute leukemia, they are hard to cure.